The Nandroya Falls is the highpoint of the Nandroya Falls walk which begins at the Henrietta Creek picnic and camping ground on the Palmerston Highway. Allow 3 hrs to complete the full ring route. The first stage of the walk begins with crossing Henrietta creek. You can cross through the creek on foot, provided that the creek is not in flood or you can walk back onto the highway and cross the creek using the bridge. The walk commences close to the road way, marked by a walking path marker. 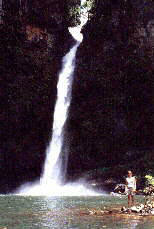 About 500m before the Nandroya Falls are the Silver Creek Falls. Here there is a good photo opportunity and safe drinking water.